Ramen Cubism is no speakeasy, though its location makes it seem like it is. Despite taking the basement space of a commercial building sandwiched between Stanley Street and Wellington Street on the stretch near Lan Kwai Fong, the new ramen shop is far from difficult to spot. A single-file beeline stretching from the only brightly-lit space situated halfway down the dimmed alleyway will point you towards Ramen Cubism, and you’ll notice the brightly coloured graffiti mural on the wall, painted by Russian artist Sergei Rozhnow. Inside, the animated chefs presenting and serving ramen gave the brand a youthful, energetic vibe, while the predominant wood finish of the interiors evoke a naturally cosy ambiance that have come to define ramen eateries. As the first ramen restaurant outside of its native Osaka, Hong Kong’s Ramen Cubism is co-presented by Japan’s ramen personalities Hayashi Takao and Matsumura Takahiro. 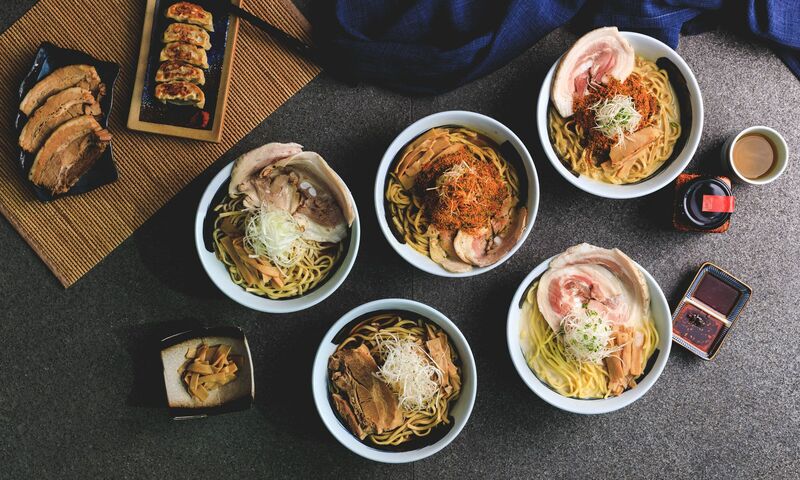 Together with Bird Kingdom Group, they opened the Hong Kong branch last month, presenting five ramen varieties; one of which is limited to 200 servings a day, together with a handful of snacks on the side. We ordered the Sky Bird—white soup ramen, where the broth is richly simmered with chicken and is milky and unctuous. A bed of julienned leek rests atop thinly sliced braised pork. The noodles were a pleasant and glutinous to the bite, while the broth was creamy and rich—if only it was hotter than its tepid temperature. The Sea Soy Soup ramen, Ramen Cubism’s only shoyu-based variety, arrived steaming. The signature umami-rich broth was balanced with seasoning thanks to a good blend of Japanese soy sauce and bonito, but that was about the only asset. The fresh ramen noodles were overcooked and clumped together into one solid chunk, but the main thing we took issue with was the slow-cooked pork: an uncut slab of dry, stringy mass that we found it tough to finish. The soft-boiled eggs were adequately seasoned and with molten yolks, and were more satisfying than the signature Matsu Hayashi dumplings. The gyoza were crispy on the outside but underseasoned within, and needed the restaurant’s signature chilli dip to give it a kick in flavour. Ramen Cubism offers a small selection of brews from Coedo as well as sodas, but most guests preferred simply water at the table. Service was speedy most of the time but the staff can benefit from gaining familiarity on the varieties of ramen served and offer sound introductions to first-time visitors. With a steady flow of clientele thanks to Hong Kong’s never-ending fascination with Japanese ramen, Ramen Cubism stays true to catering to the local interest in the quintessential fast casual item. Rather than peddling fancy varieties to stay at the top of the ramen wave, the establishment would benefit from offering better quality and consistency in the varieties they proudly call their signatures, if they want to keep customers returning. Each of our reviewers score restaurants based on four main criteria: setting, food, service, and drinks, taking into account more than 35 different points of reference including manners of staff, usefulness of the wine list, and whether or not the restaurant makes an effort to be environmentally aware. 5/5 indicates an exceptional experience; 4-4.5/5 is excellent; 3-3.5/5 is good to very good; 2.5/5 or lower is average to below average. Before visiting a restaurant, the reviewers will book using a pseudonym and do not make themselves known to restaurant staff, in order to experience the venue as a regular guest—if this is not possible, or if we are recognised, we will indicate this in the review.